GRAND CHUTE, WI - The Wisconsin Timber Rattlers had a busy season off the field with their charitable works. The Midwest League affiliate of the Milwaukee Brewers is reporting on their year as 2018 is coming to a close and they are preparing for 2019. The two main fundraisers for the Timber Rattlers were the Golf Outing and their specialty jersey auctions. The 2018 Golf Outing was held at Shamrock Heights Golf Course and raised over $6,700 with the participation of 82 area golfers plus 17 members of the Timber Rattlers team including players, coaches, and front office personnel. The team held seven auctions for their alternate jerseys that included the Brats, Salute to Cows, Star Wars™, Wisconsin Badgers, & Brewers Sunday uniforms and raised nearly $13,000 for local charities. The 2019 Timber Rattlers Golf Outing is scheduled for June 3. The Rattlers are in the process of creating their alternate jerseys for next season. The team was also involved in programs like Whiffer's Fitness Program and Fang's Reading Club. The fitness program helped to get kids in the Fox Cities to get and stay active. The reading club is an incentive-based program that allows schools in Northeastern Wisconsin and the Upper Peninsula to get children from Kindergarten through fifth grade involved in reading. Mascots Whiffer & Fang got into the charitable spirit on their birthdays, too. Whiffer's Birthday in March coincided with the team's individual tickets on sale date and a Help for the Homeless Drive that collected hygiene products for area homeless shelters. Fang's Birthday in August collected 328 pounds in non-perishable food items as part of the Cans for Cake food drive. The Rattlers didn't just collect food. They also grew and harvested over 400 pounds of food in the Greenstone Farm Credit Services Ballpark Garden at Neuroscience Group Field. The fresh vegetables were taken to St. Joe's Food Pantry. Area Little Leagues were presented with over 2000 hats with the support of the Rattlers. 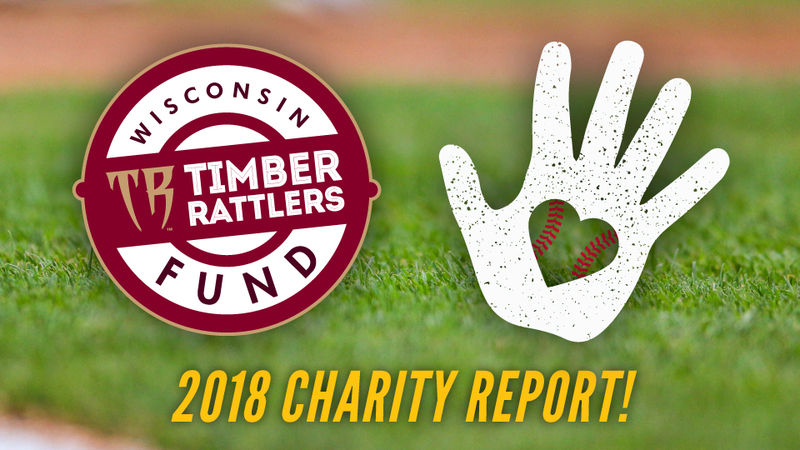 Some of the charities helped by the Wisconsin Timber Rattlers in 2018 included Make-A-Wish Wisconsin, Children's Hospital of Wisconsin, Fox Valley Veterans Council, Children's Cancer Family Foundation of Northeast Wisconsin, St. Joe's Food Pantry, Freedom Food Pantry, and Miracle League of the Fox Valley. Numerous other charities were also given Timber Rattlers ticket vouchers to be used in their own fundraisers. The Timber Rattlers could not have accomplished this without the support of the players, coaches, and community. The team established the Wisconsin Timber Rattlers Fund with the Community Foundation of the Fox Valley Region in 2016 to benefit the team's charitable works.